A team discusses their ideas for a solution. Having issues with your cat, Fluffy, peeing on your favorite rug? You’re not alone. Hoping to come up with some solutions to this prevalent problem plaguing cat owners everywhere, two current veterinarians, Illinois College of Veterinary Medicine alums, Drs. 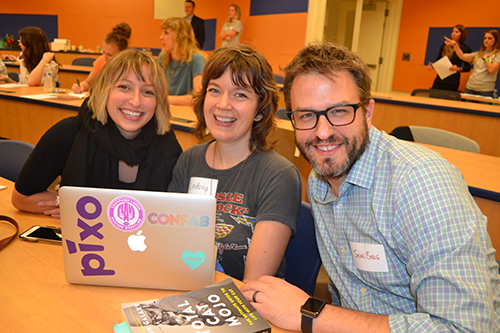 Aaron Smiley (DVM ’07) and Brooke Fowler (DVM ’08), organized the recent Hackathon: Thinking Outside the Box About Feline House Soiling, which was held on Wednesday, October 10th. Sponsored by Purina, Elanco, Boehringer Ingelheim, and Medici, the Hackathon offered a $2,500 grand prize as an incentive, which attracted 39 participants interesting in coming up with a solution (and winning the prize). Drs. 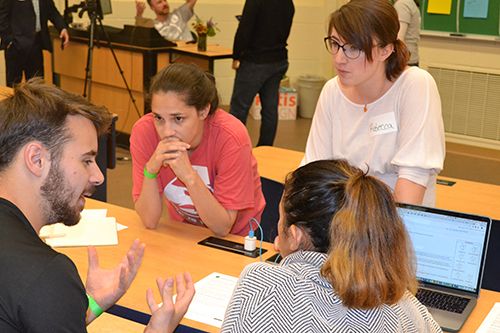 Aaron Smiley (left) and Brooke Fowler (right) during the Hackathon. In the world today, one of the most common reasons for house cats being relinquished to shelters is having urinary issues which cause them to soil in the house outside their litter box. In fact, it can be very difficult for some cats to learn how to properly use a litter box, which can make them rather unappealing for owners who are unable to put in the extra time to deal with the issue. Fowler, who is a veterinary oncologist in private practice at a specialty hospital in Boulder, Colorado, and Smiley, who has a practice in Indiana, have realized the significance of this problem and have an idea for why a quality solution has yet to be found. They think that this problem still exists because of the way the typical veterinarian thinks. A member of the first place MeowApp! team writes their ideas on a white board. As a result, the two believe that one way to come up with a solution might be to get people from other disciplines involved. So, they decided to return to their alma mater to host a hackathon, which is a contest designed for people to team up and use technology to solve a problem. The idea was for specialists in a variety of disciplines, including computer science, engineering, architecture, design, and, of course, veterinary medicine, to work together to find a way to help cats who are not using their litter box. A Hackathon participant pitches her idea, which eventually became the third place runner up team, Cat in the Box. Local civil engineer Hugh Gallivan, who attended the hackathon. The Pixo team (who placed second with their SCRATCH app) working on their design ideas. The panel of judges at the Vet Med Hackathon. 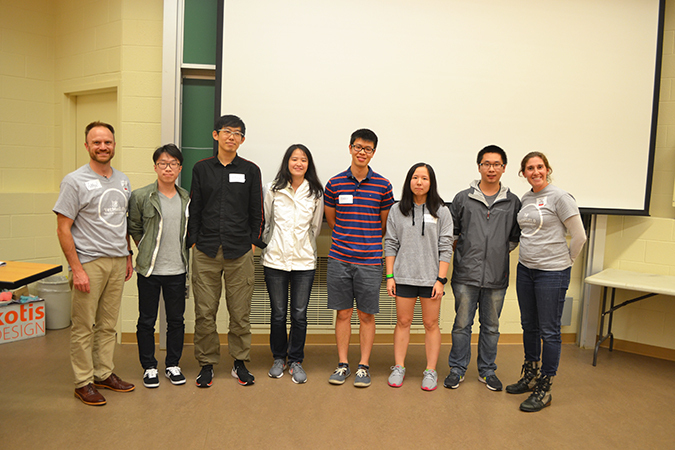 The hackathon began with a short introduction by Smiley and Fowler, followed by some information presented by Rachel Switzky, the director of the new Siebel Design Center. 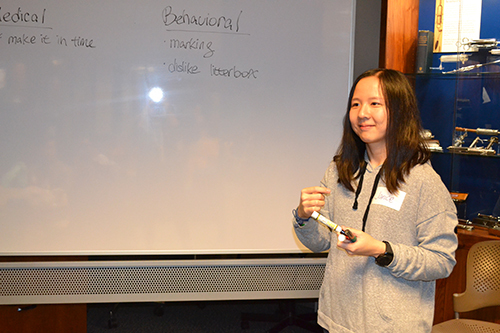 Her goal was to introduce participants to ideation, which involves looking at the end user when designing a solution to a problem. All participants were guided through this in the beginning, then had a chance to individually present their ideas so teams could form around them. Once teams were formed, there was a finite amount of time designated for working together to solve the problem before they presented their solution to the judges. A Hackathon participant, retired electrician Glen Roberts of Champaign who participated in the Hackathon because he has had cats before, and thought that he would come to see what he could come up with. What is the recommended size of a litter box? Are there any alternatives to litter boxes? What is it about peeing on soft things on the ground? How else do cats mark their territory? Is it typical to not contact a vet about litter box issues? Do cat owners usually resign themselves to these behaviors? How is trauma diagnosed and treated in cats? Do cats get angry? Do they pee out of spite? Why are some cats more adaptable than others? 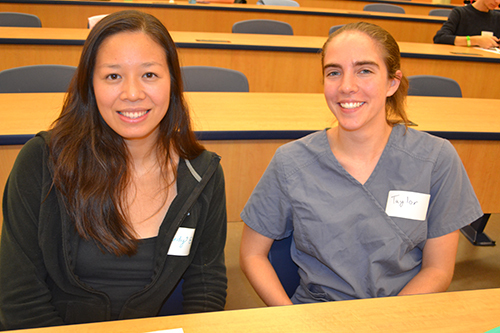 Two participants who attened the Vet Med Hackathon. Many teams opted to create websites or mobile applications which helped educate cat owners and diagnose problems. After coming up with creative, cutesy names for their solutions, such as SCRATCH, EduCATion, Dr P-Little, Cat in the Box, and LITTERAL APEEAL: THE PURRFECT BOX, teams then presented their ideas to a group of prestigious judges who evaluated the ideas based on the following criteria: originality, plausibility, solves the problem, and presentation. An example of MeowApp's user interface shown during their final presentation PowerPoint. 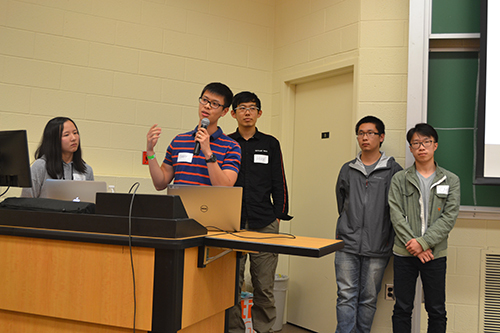 At the end of the day, a group of Illinois computer science students took home the grand prize for designing a mobile application called “MeowApp!” which had a platform that would ask cat owners questions to help diagnose the problem, and included a machine-learning algorithm which gathered data from strategically-placed cameras to monitor cats’ household elimination habits and a well-thought-out business model. The winning team giving their presentation about their MeowApp!” design. When asked about the ultimate goal of the event, both Fowler and Smiley were hoping for a new way of thinking to emerge among the participants. Smiley cited the importance of working across disciplines. Story by Patrick Pavilonis. Photographs by Elizabeth Innes, Communications Specialist, I-STEM Education Initiative. 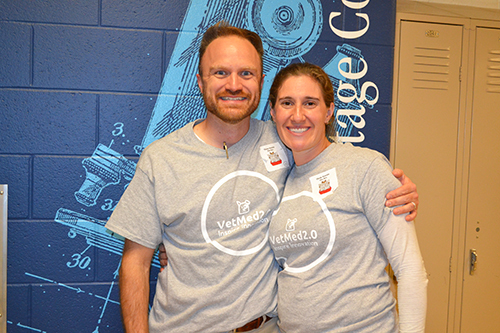 The winning team of the Vet Med Hackathon with Dr. Smiley and Dr. Fowler.